The droid crew of a galactic space freighter have turned against their masters and eradicated every human crew member! 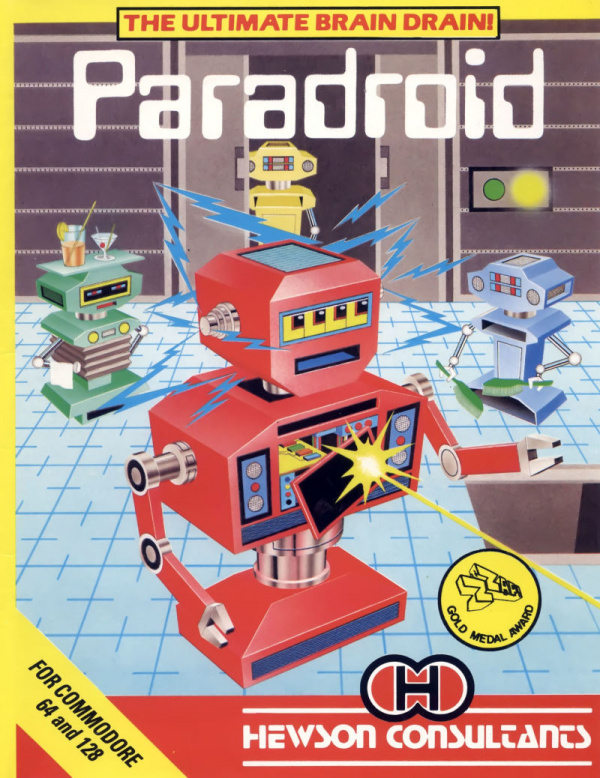 Legendary amongst C64 fans, and one of the highest rated games of the time, Paradroid’s depth of gameplay has kept it a firm favourite over 20 years later. 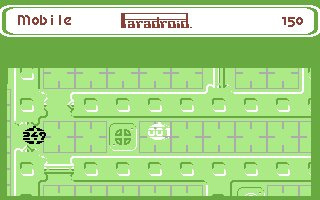 Loosely categorised as a shoot-em-up, this description belies the subtle complexities to be found whilst you go about your business of clearing deck after deck of rogue droids. With each droid designated a number to represent the approximate power at its disposal, you soon get to know the ones to avoid and the ones to pick on. The humble 001 that you start as really isn’t up to much more than shooting the unarmed menial droids, using its low powered laser. It’s time for an upgrade! By holding down the fire button you can go into a “transfer” mode. A collision with another droid whilst in this mode results in a sub-game. Here you attempt to take over the other droid by applying pulses to a circuit board (it’s more involved and better than it sounds!) against a time limit. If you win, you gain temporary control of your enemy and can make the most of their weaponry. However, the higher the class of droid, the shorter your influence device can keep control, and before too long you will run out of energy and revert back to an 001. Viewed from above, with a fairly small but adequate play area, a lot of the enjoyment whilst patrolling decks comes from the fact that you can only see droids in your line of sight. This leads to some fairly tense moments when you are low on power and know there is an 821 roaming around, but you are not sure exactly where. Maybe it is behind the sliding door you are about to go through? The difficulty is pitched just about perfectly. It's very easy to start with, as you are placed on decks with harmless occupants, but as you progress to other decks (utilising the simple but effective lift system) things become more heated. This is where you need to have a strategy of which decks to clear first and which to save for later. 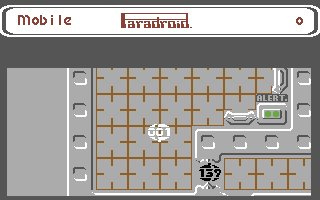 The controls are very responsive, but take a little bit of getting used to as you have several functions mapped to the one fire button and your droid has a tiny bit of inertia (it does not stop immediately when you release a direction). Other features include recharge stations, which allow you to recoup health lost in battle (from laser or disrupter fire), but they won’t help if you are losing energy as a result of controlling another droid for too long. There is also an excellent droid library that you can peruse whilst logged on to a console, to learn about the strengths and weaknesses of your opponents. 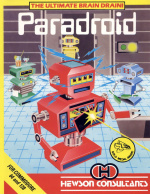 Graphically accomplished at the time with a unique bas-relief style (arguably superseded by the Heavy Metal Edition that followed), and some superb presentation, Paradroid still looks acceptable today. 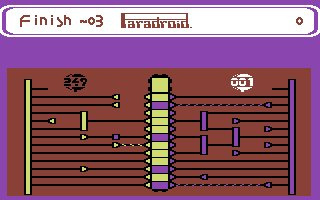 Soundwise, there is no music to speak of (aside from the peculiar sound effects tune on the title screen), but the spot effects are well implemented and memorable -- particularly the noise you emit when in transfer mode! Whether you are caught in an intense battle with several high class droids, searching to find the last droid on a deck, or in a transfer battle against the fearsome 999, there is always something to keep you involved. 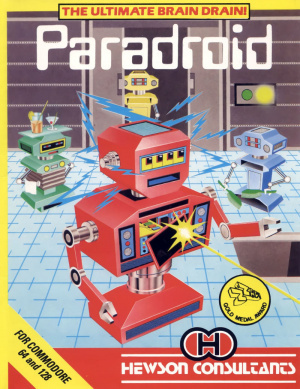 There is not enough room to cover the incredible attention to detail that Andrew Braybrook put into the creation of Paradroid. This has ensured its longevity and will keep you returning to it long after other games of the era have become stale. If you missed out on this the first time around, you really owe it to yourself to give it a try now, and at only 500 Wii points it comes very highly recommended. Looks a little confusing, but I'll probulay buy it nonetheless. The best C64 game on the Virtual Console. Deep gameplay and great audiovisuals. Well designed with lots of style. I hope America and Australia will get it soon.